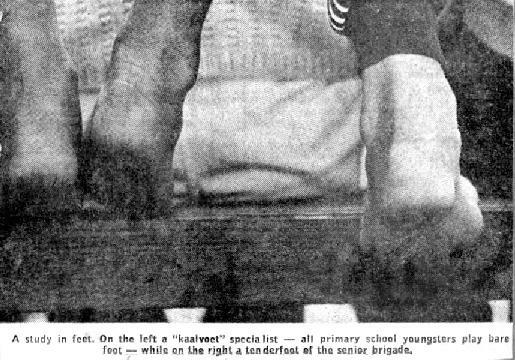 This "kaalvoet specialist" picture also appeared in "The Star" recently. KAALVOET: An Afrikaans word used by English-speakers, it means bare-footed and is pronounced "carl-foot." Schoolboy rugby players from sissy suburbs are wary of opposing players who run on the field kaalvoet. It means they are hardened, feel little pain, and should be avoided if possible. In the platteland (see that entry), many youngsters and quite a few adults routinely walk about kaalvoet, even in winter. PLATTELAND: South Africans use this word when they refer to the boondocks, the countryside. It means literally "flat land" but is applied to mountainous and hilly regions too, like the area near Cape Town where the world's best wine comes from.